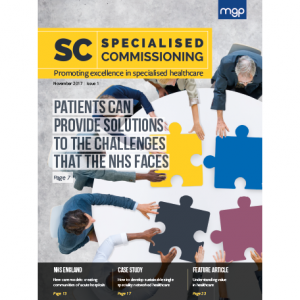 14 November 2017—MGP Ltd, a UK-based healthcare media company, is delighted to announce the launch of Specialised Commissioning: a new quarterly journal for healthcare professionals, directors, and managers who have a role or interest in specialised commissioning. feature insights from all interested parties—including healthcare professionals, commissioners, patient groups, charities, and the pharmaceutical industry. This new journal will be delivered free of charge to an influential audience of over 4000 clinical commissioners, decision makers, healthcare professionals, medicines management pharmacists, directors, and managers. MGP is also pleased to offer a range of advertising and medical education opportunities linked to Specialised Commissioning, to reach this unique and influential audience in specialist and secondary care medicines. To discuss these opportunities or to find out more information about Specialised Commissioning please contact Matthew Eisenstadt, Sales Director at MGP, at matthew.eisenstadt@mgp.co.uk or on 07815 078360. If you would like an image of the new journal, please do not hesitate to contact us. MGP Ltd is a specialist healthcare media company based in Chesham, Buckinghamshire. Our aim is to improve patients’ lives by promoting best practice in healthcare. MGP specialises in multichannel content and educational projects based around clinical guidance and evidence-based information through its brands: Guidelines, Guidelines in Practice, Guidelines for Nurses, and Specialised Commissioning.